It is worth stressing that foraging strategies will not always be strategies for simply maximizing feeding efficiency. On the contrary, natural selection will favor foragers that maximize their net benefits, and strategies will therefore often be modified by other, conflicting demands on the individuals concerned. In particular, the need to avoid predators will frequently affect an animal's foraging behavior. These risks appear to modify the behavior of the nymphs, in that they tend (both in the laboratory and in the field) to avoid the coevolution: predator-prey arms races? Yet these central areas also contain the greatest concentration of prey items for the nymphs, and so, by avoiding predators, nymphs of instars I and II showed a reduction in feeding rate in the presence of adults (although those of instar III did not). The young nymphs displayed a less than maximal feeding rate as a result of their avoidance of predation, but an increased survivorship. The modifying influence of predators on foraging behavior has also been studied by Werner et al. (1983b) working on bluegill sunfish. They estimated the net energy returns from foraging in three contrasting laboratory habitats - in open water, amongst water weeds and on bare sediment - and they examined how prey densities varied in comparable natural habitats in a lake through the seasons. They were then able to predict the time at which the sunfish should switch between different lake habitats so as to maximize their overall net energy returns. 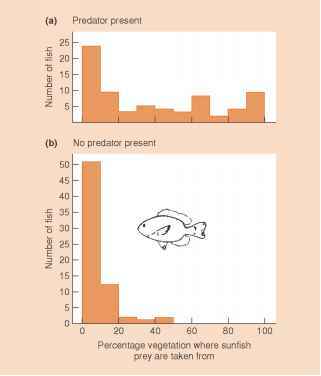 In the absence of predators, three sizes of sunfish behaved as predicted (Figure 9.18). But in a further field experiment, this time in the presence of predatory largemouth bass, the small sunfish restricted their foraging to the water weed habitat (Figure 9.19) (Werner et al., 1983a). Here, they were relatively safe from predation, although they could only achieve a markedly submaximal rate of energy intake. 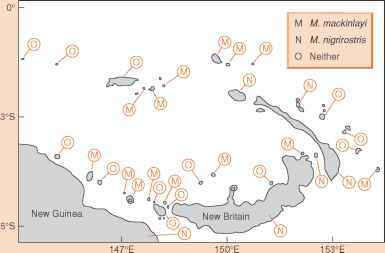 By contrast, the larger sunfish are more or less safe from predation by bass, and they continued to forage according to the optimal foraging predictions. In a similar vein, the nymphs of several species of algivorous mayflies largely restrict their feeding to the hours of darkness in streams that contain brown trout, reducing their overall feeding rates but also reducing the risk of predation (Townsend, 2003). In the case of mammals that feed at night, including mice, porcupines and hares, time spent feeding may be reduced in bright moonlight when predation risk is highest (Kie, 1999). abundant and where they choose to feed are all key components of their 'realized niches'. We saw in Chapter 8 that realized niches can be highly constrained by competitors. Here, we see that they can also be highly constrained by predators. This is also seen in the effects of predation by the barn owl (Tyto alba) on the foraging behavior of three heteromyid rodents, the Arizona pocket mouse (Perognathus amplus), Bailey's pocket mouse (P. baileyi) and Merriam's kangaroo rat (Dipodomys merriami) (Brown et al., 1988). In the presence of owls, all three species moved to microhabitats where they were less at risk from owl predation and where they reduced their foraging activity. However they did so to varying extents, such that the way in which the microhabitat was partitioned between them was quite different in the presence and absence of owls.